Something magical happens if you see the same employee twice at the Four Seasons Resort in Lanai, HI. Even if you’ve encountered this employee for only an instant the first time, chances are good they will address you by name the second time around. With this warm recognition happening over and over, there are two feelings that wash over you. A Four Seasons’ guest is meant to feel special, and you can’t help but feel at home in this Lanai enchanted garden of a property located on peaceful Hulopoe Bay. The early morning is when the Four Season magic begins. As you make your way to the spectacular indoor-outdoor One Forty restaurant for breakfast, you notice a staffer sprinkle colorful bougainvillea petals throughout the garden area surrounding the pool and sun loungers pointing toward the ocean. A simple touch, a colorful touch, that’s mindful of the amazing attention to detail that is a Four Seasons way of life for new and returning guests. 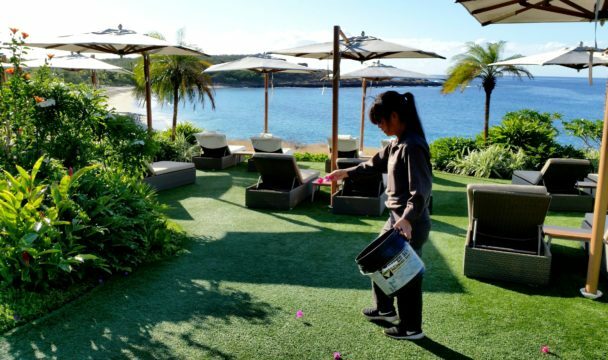 “Everything we do here at the Four Seasons Resort Lanai is like the story of the swan who appears so graceful above the surface, but is feverishly paddling unseen below the water. If we can keep both parts working for our guests, then we’re doing something right,” General Manager Alastair McAlpine said. Four Seasons’ trademark service and amenities kick in as soon as you step inside your well appointed suite. With the press of a button your terrace shade floats upward. Press another button and a video screen embedded in your bathroom mirror greets you by name, along with the time and temperature. Another button and your amazing sensory powered Toto toilet has you feeling like you’ve entered a futuristic time capsule. As nice as Four Seasons Lanai’s pro-active touches are, it’s the resort’s incredible 90,000-acre outdoor landscape that gently wraps guests into a blissful vacation dream-state. The imported hardwoods, Asian artwork, botanical gardens, the pool, the cascading waterfall, lava rock grotto, two spas, Hulopoe Bay Beach, and the Pacific Ocean merge to create an island setting that is without peer. The multi-million dollar figure attached to this resort renovation borders on priceless. Each Four Seasons Resort throughout the world is known for creating an incomparable breakfast experience. The views at the Four Seasons Lanai’s One Forty restaurant are hard to put into words. Imagine savoring your favorite breakfast entrée while witnessing a pod of dolphins frolicking in the ocean. 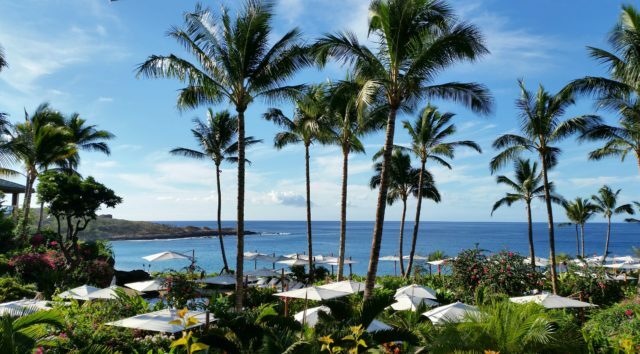 A great lunch option is to shuttle over to the neighboring Manele Golf Course and take in the aptly name Views restaurant. Absorbing the panoramic views over an Ahi Tuna Salad and a Guava Mint Lemonade will have you returning to the resort in full relaxation mode. 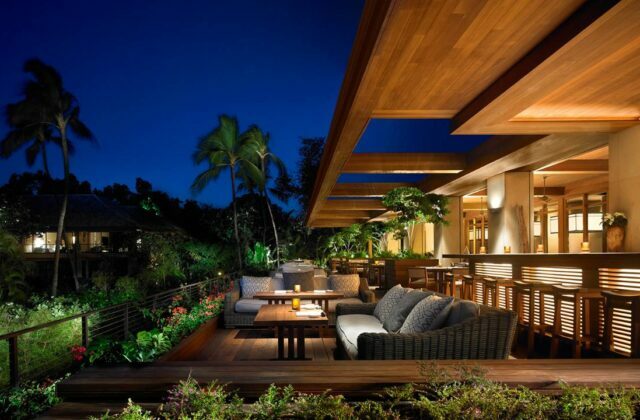 Evening means taking in the chic ambiance of the al fresco Nobu restaurant. Sample Chef Matsuhisa’s Rock Shrimp Tempura or Scallop Jalapeno and you’ll simply melt in your perfect island surroundings. Top off your scrumptious evening with a Pineapple Martini or a Valrhona Dark Chocolate Fondant. 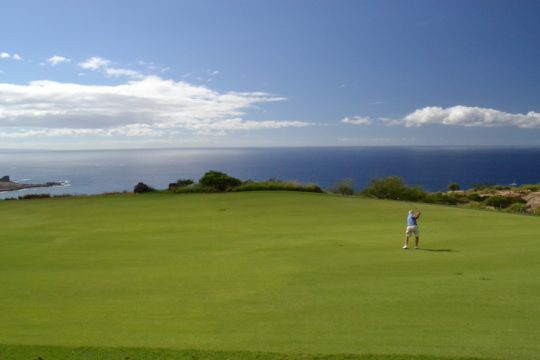 The Jack Nicklaus designed Manele Golf Course is a golf thriller of extreme elevations, breathtaking ocean holes, and 18-holes of scenery that gets better with each new shot. Think of your all-time favorite golf course, and then compare it to Manele. 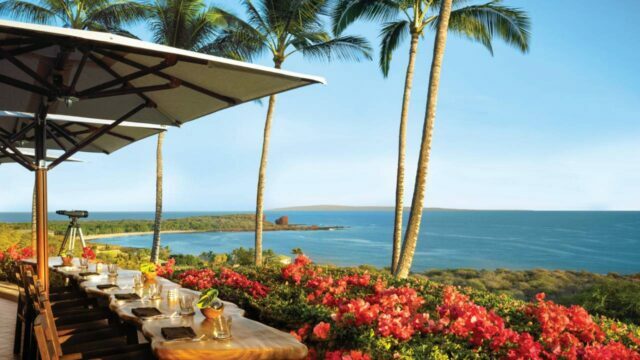 The Four Seasons Resort in Lanai sets the vacation bar sky high. 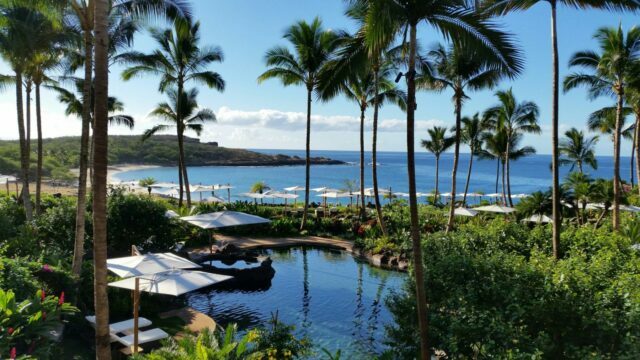 Ocean excursions abound at the Four Seasons Lanai. The snorkeling near Puu Pehe “Sweetheart Rock” abounds with fish, sea turtles, and Spinner dolphins. A Sunset Sail and a Maui day-trip can also be arranged to indulge in these awesome Pacific Ocean surroundings. The Lanai landscape offers a bounty of adventure activities. The Four Seasons’ reach includes the Lanai Archery and Shooting Range, as well as off road excursions featuring Polaris Ranger Utility Terrain Vehicles. Lanai is also a great venue for riding horseback throughout the Koele hills. 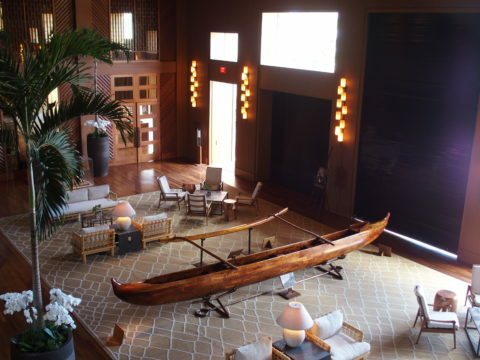 As you watch guests leave the Four Seasons Resort Lanai, you’ll notice a recurring ritual. Laughter, hugs, and even an occasional tear is shed between guests and long-time staffers. You reflect and realize there is an intrinsic value to learning someone’s name. The guest who arrives as a stranger is now saying goodbye to a friend. When the final Four Seasons Lanai “aloha’” is exchanged, it’s grudgingly time to hop aboard the complimentary shuttle to the airport. 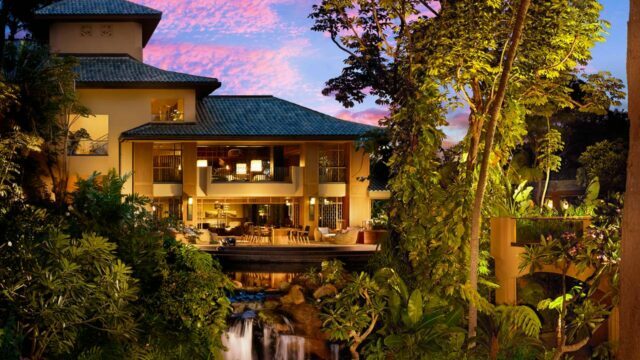 As you glance back at this Lanai oasis, that’s when you realize that your new favorite bird is the swan. Tim Cotroneo is a freelance writer specializing in island travel, business, and golf.